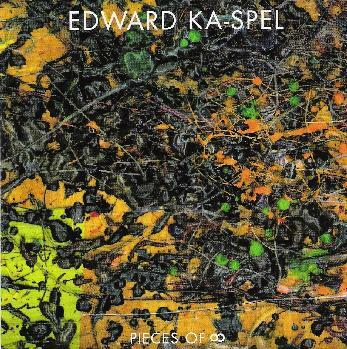 Edward Ka-Spel - "Pieces of 8"
When reviewing Ka-Spel's solo work, it's always difficult to distance oneself from the obvious comparisons one can make to the Legendary Pink Dots, if only because Ka-Spel's voice and vision is such an integral element in the psychedelic chemistry that defines LPD as one of the most original groups to emerge from the post-punk flux of the 80s. Fortunately, Pieces of 8 is perhaps Ka-Spel's least LPD-like work to date. Ever protean, Ka-Spel's lyrical vision takes a backseat on Pieces of 8 to soundscape and ambient collage. "Here Comes the Night" effortlessly surges out of waves of synthetic vibrations borne aloft on the electro-static bleep of a computer lost in the outer reaches of the cosmos. The steady metronomic pulse of sequencer and electronic drums sends the listener hurtling through deep whirlpools of some forgotten astral sea. Ka-Spel's debt to the Berlin sound, though evident throughout Pieces of 8, is hardly obtrusive. "Alms for Lepers," for instance, is perhaps the closest Ka-Spel comes to the spirit of the traditional Pink Dot sound: mannered vocals, lyrics as surrealistic as a Dali painting, lovingly conceived melodicism, and a determination to use the full potential of the post-modern recording studio as a tool to tinker with sound and texture. Of course, a piece like "Shanti," with its droning accordion accompanying Ka-Spel's café/arthouse psilocybin-induced poetry reading, will no doubt leave one wondering if perhaps he's been watching too many French new wave films on his days off from the studio. But for Ka-Spel, sound itself seems to be a vast continuum through which otherwise disparate and apparently unrelated forms of music collide and fuse. As a consequence, Pieces of 8 is both frustrating and challenging simultaneously. One simply never knows what to expect next. The album's coda, "8.2 8.3," serves to illustrate this salient feature of Ka-Spel's fractured musical persona, as it virtually retraces the varying moods and atmospheres of the previous compositions and serves as a kind of forge on which sound itself is shaped and reshaped into an elemental form, a kind of template for a music of the spheres or a score for a future cosmic opera that can only be heard in the interstices of the light years. In other words, Pieces of 8 is nothing if not quixotic - it's your ticket to the dark side of the moon. For more information you can visit the Beta-Lactum Ring Records web site at: http://www.blrrecords.com. Contact via snail mail c/o Beta-Lactum Ring Records; PO Box 6715; Portland, OR 97228-6715.